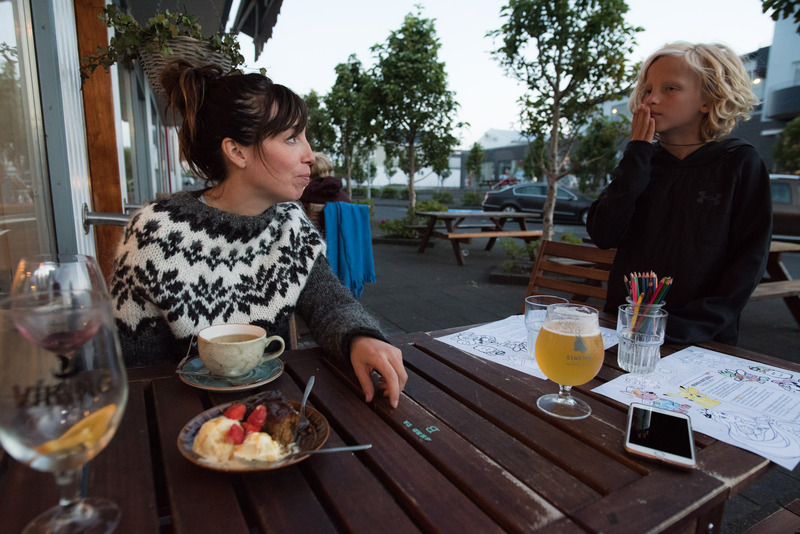 The best piece of Iceland travel advice came from a local in Reyjakvik. 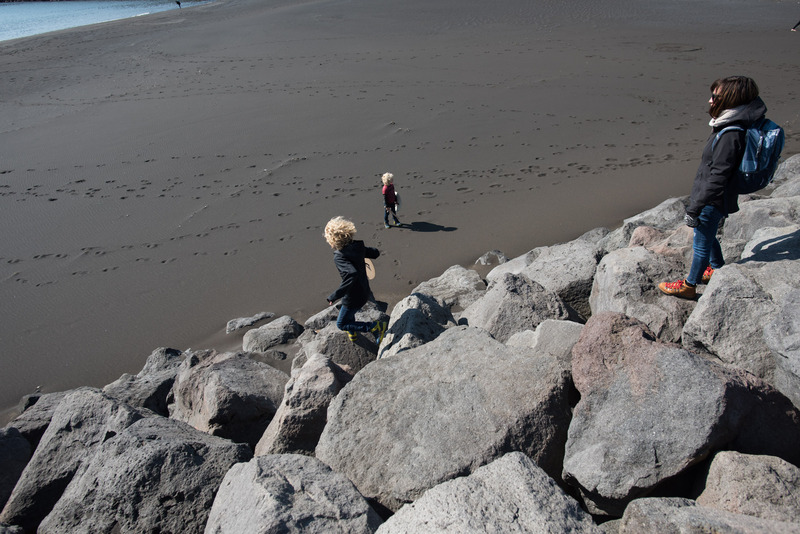 We were swimming (or lounging, more accurately – they’re geothermally heated) at Vesturbæjarlaug, in the hot pot situated nearest the kids’ pool, and struck up a conversation with the mom next to us. 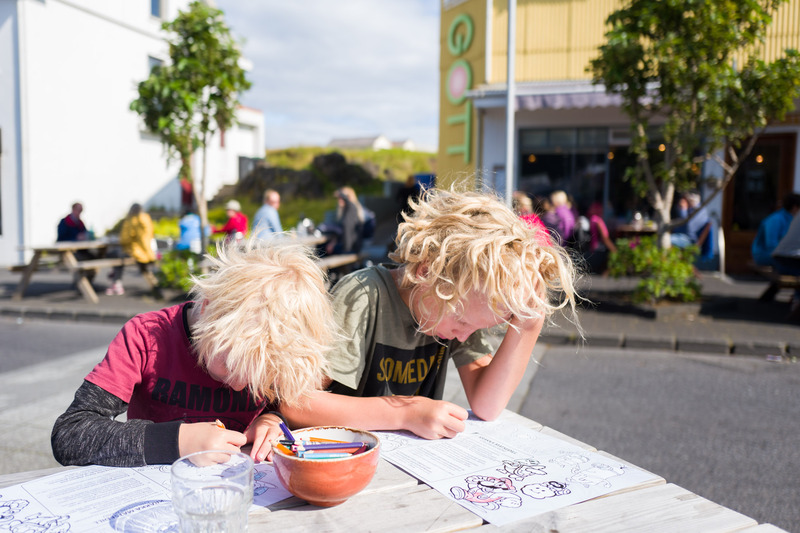 We chatted about kids for a while, then asked if she had any must-see recommendations for Iceland. Like most locals, she’s never done any of the Go Into Volcano!! 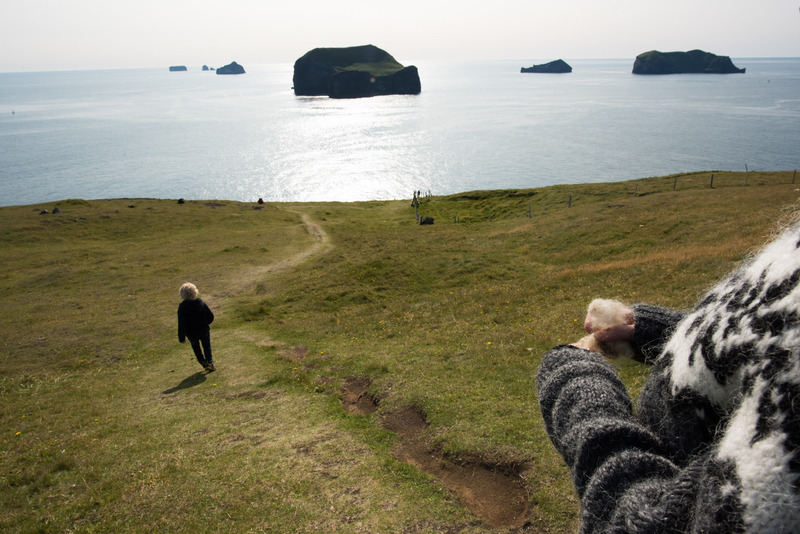 tours or visited the man-made Ice Caves, instead, she suggested, we visit the Westman Islands. 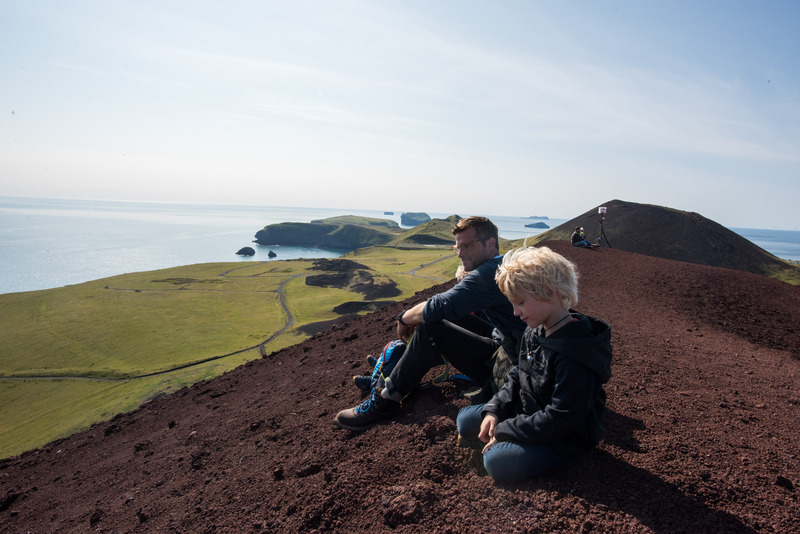 (Or in Icelandic, Vestmannaeyjar.) . 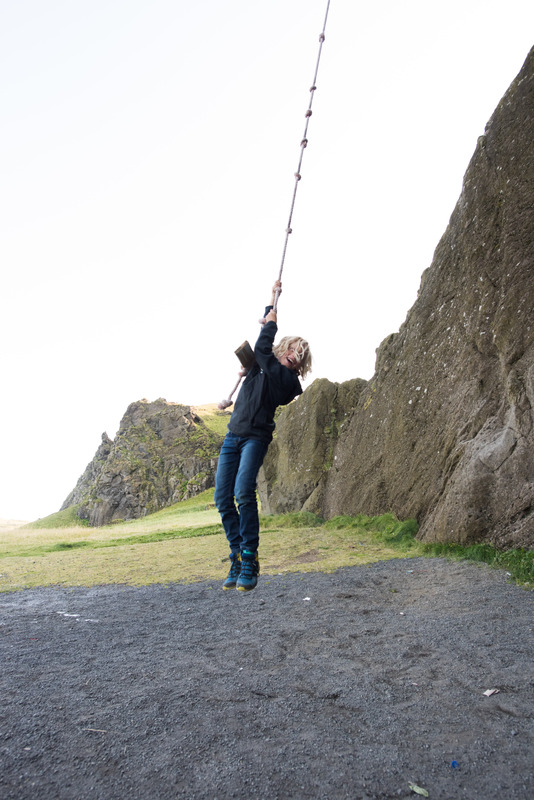 “It might be….my very favorite place in Iceland!” she said. 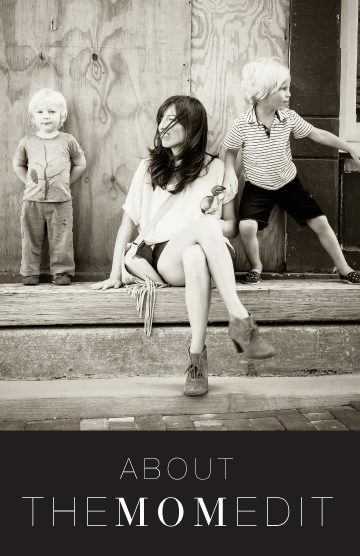 “Especially with kids.” She gushed about the adorable (live!!) 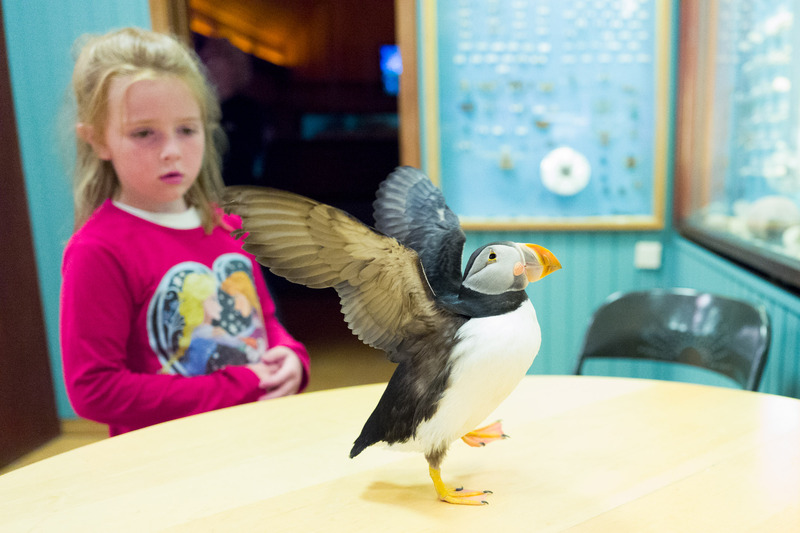 puffin who walks around the tiny aquarium, the hiking, the food (“eat at GOTT” she said, “I always go as many times as I can”), and the sprangan. So we did it. We did the whole thing. 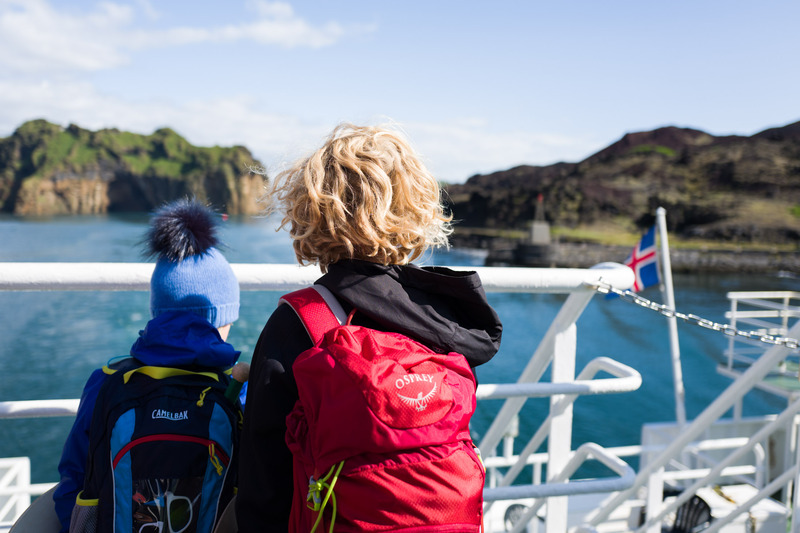 I had our week all mapped out, but had earmarked a day or two for spontaneous fun, so we planned a quick overnight to the Westman Islands. And truth be told, I wish we had added one more day. 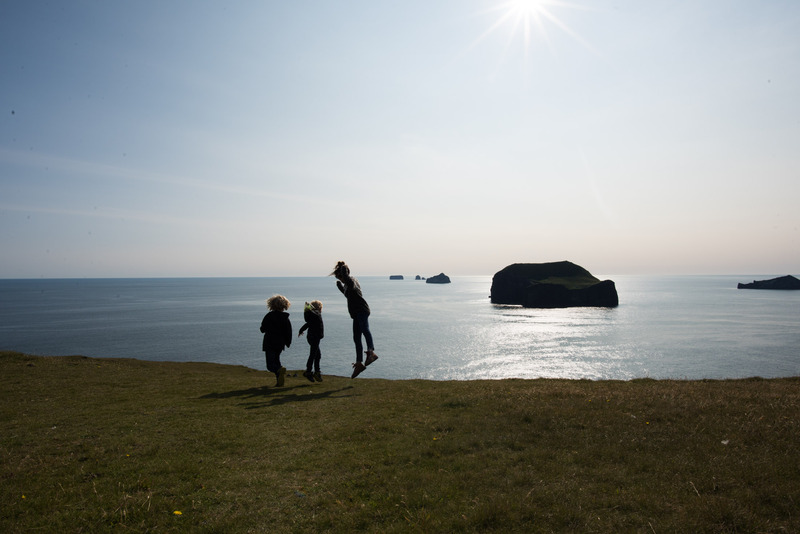 The island is gorgeous, and is something of a kid paradise. 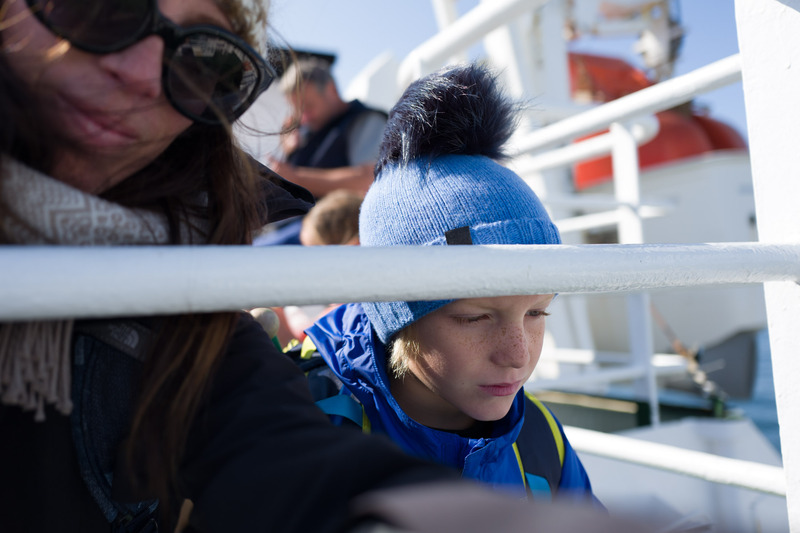 Starting with the ferry ride to get there…. 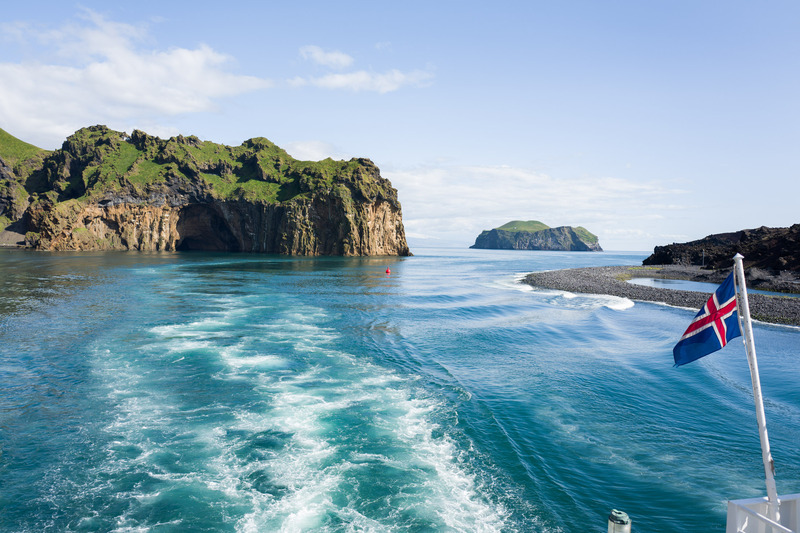 Now, our favorites from the Westman Islands….. 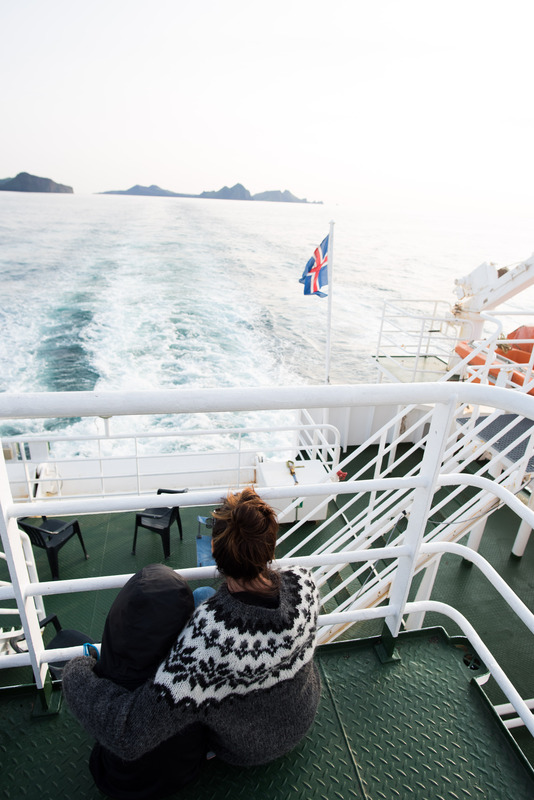 The ferry ride is roughly 35 minutes long, and leaves from Landeyjahöfn, which is a 45 minute drive from Hella (or under 2 hours from Reyjakvik). You don’t really need to book tickets in advance, unless you are taking your car. 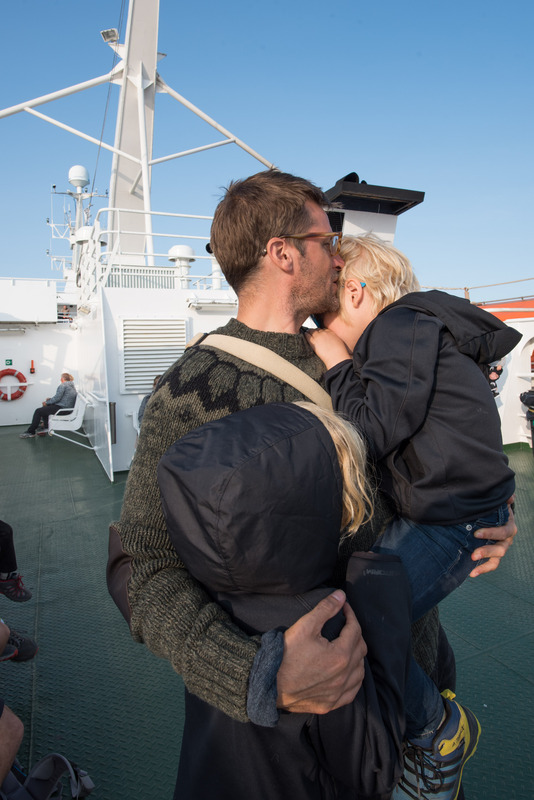 We didn’t book return tickets home, just showed up at the Westman Island docks when we were ready to go…only to learn that the ferry home didn’t have room for our car. They put us on the waitlist, and it all worked out in the end (we did get on), but lesson learned for next time. 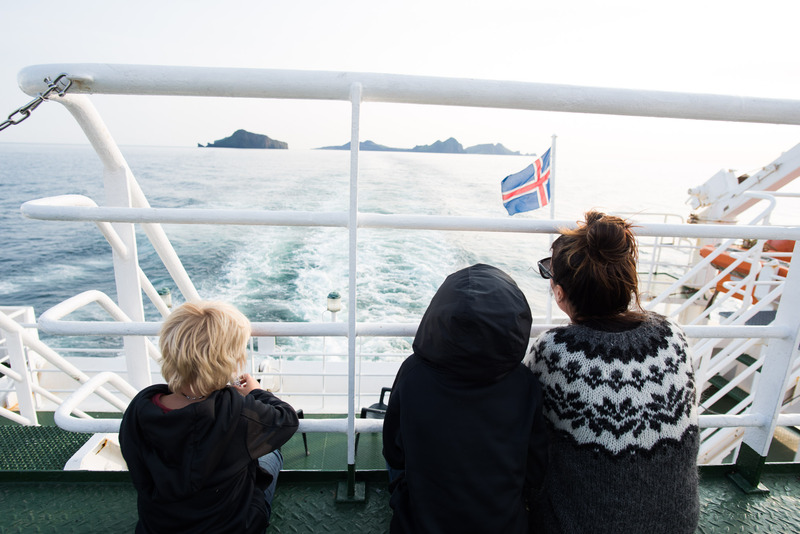 Do you need a car for the Westman Islands? I vote YES. 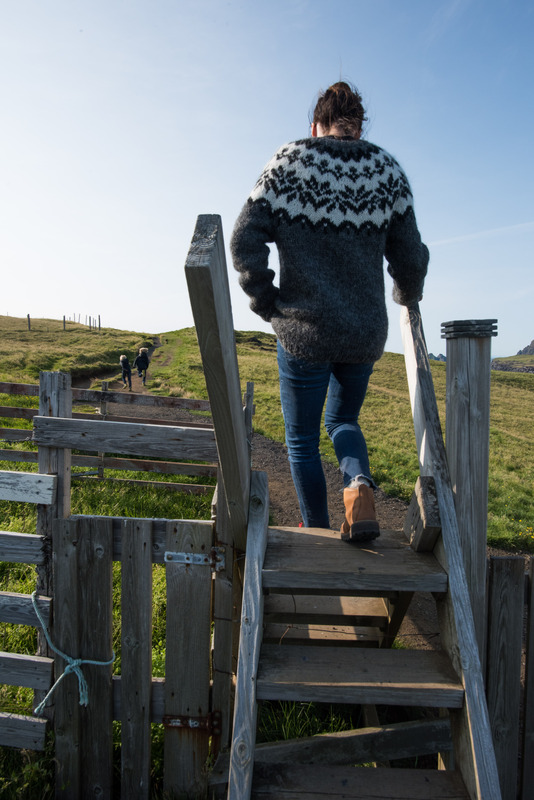 The town can easily be walked, but to really do all of the hikes and puffin viewing, you’ll need a car. 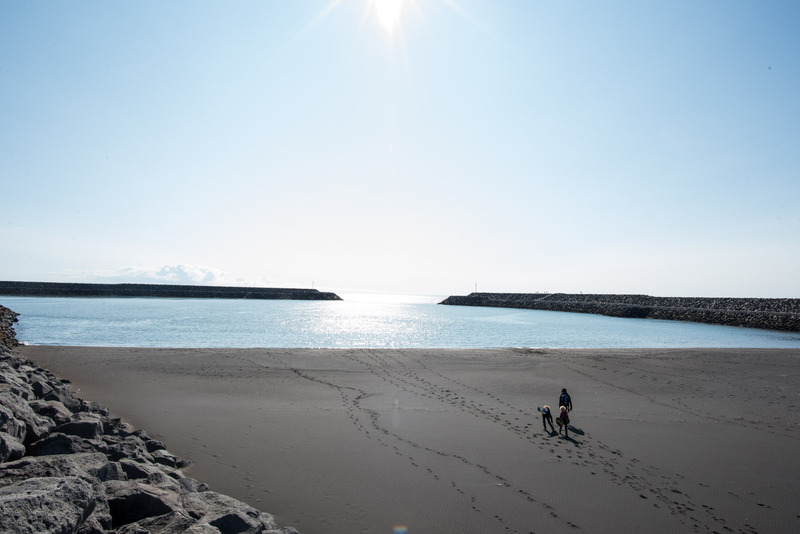 One additional note: There’s not much in the way of food at the ferry terminal in Landeyjahöfn, but there is a gorgeous black sand beach to run in while waiting for the ferry…. 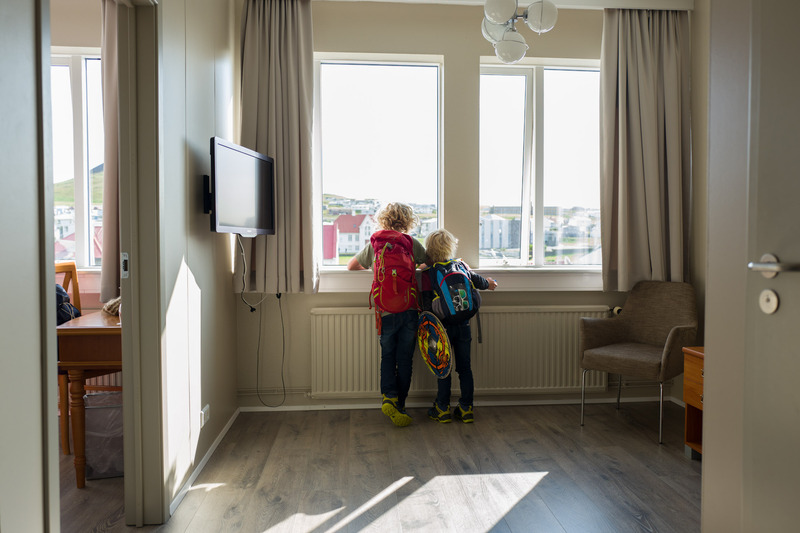 We loved Hotel Vestmannaeyjar. We booked a small suite, and they brought up cushions for the kids that easily folded away, had an insanely helpful and friendly staff, hot tubs and a game room in the basement, and easily the most amazing free breakfast buffet I’ve ever seen. We loved Gott. 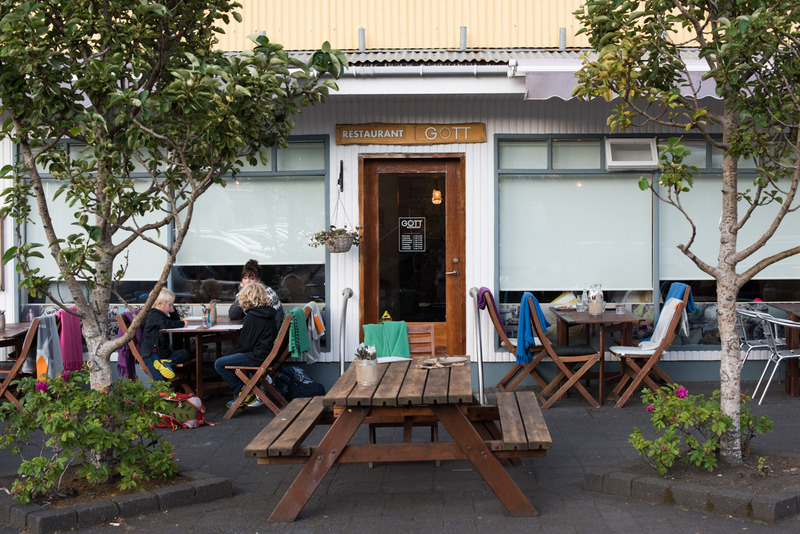 In fact, we went there for dinner and lunch…twice. Each. 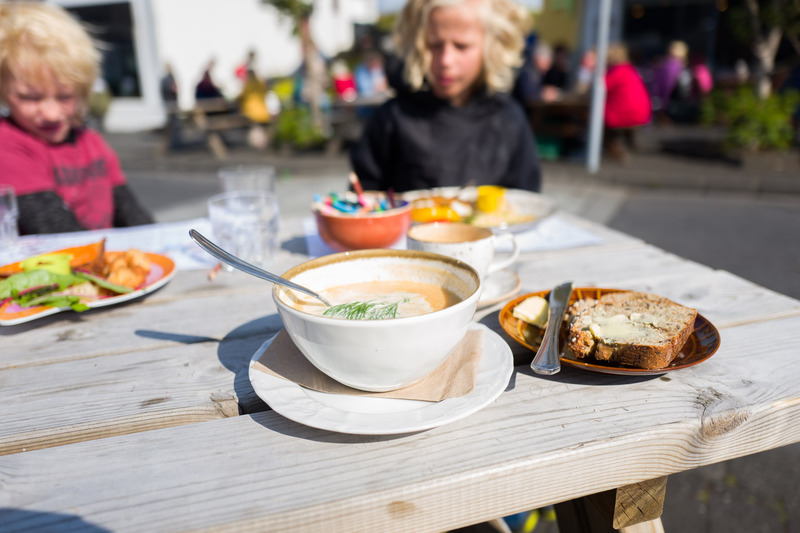 The daily seafood dish is amazing, the homemade bread (that comes with their equally delicious seafood stew) is chewy and seedy and the kids’ meals are crazy good and healthy. 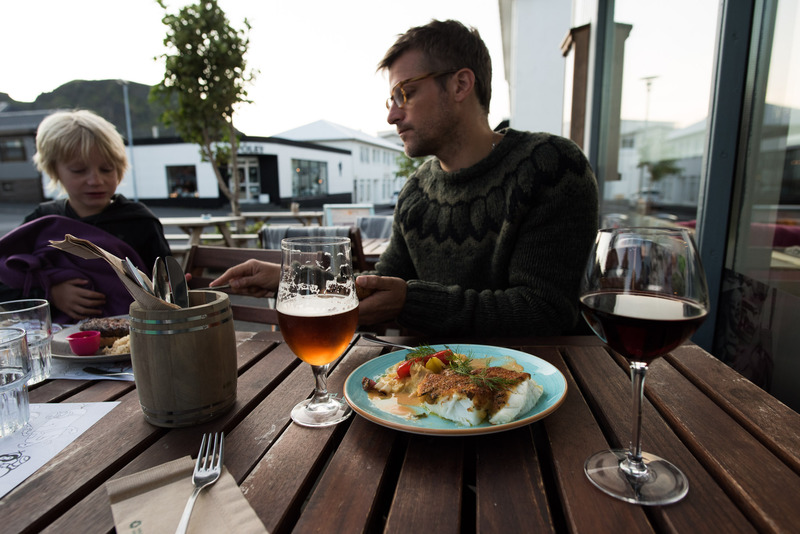 And if you sit outside for dinner, they bring blankets when it’s cold. So. Awesome. 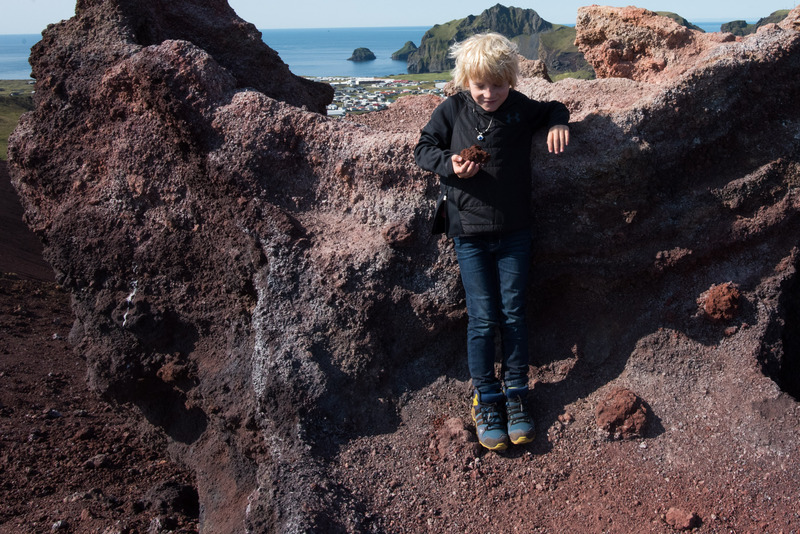 I can easily break the must-dos down into three main categories: volcanos, puffins, and sprangan. 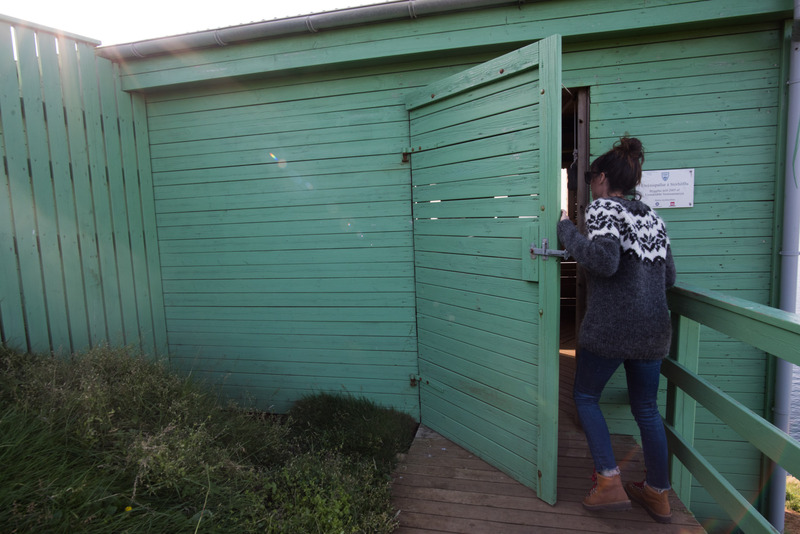 The aquarium on the Westman Islands is tiny, just a couple of small rooms. 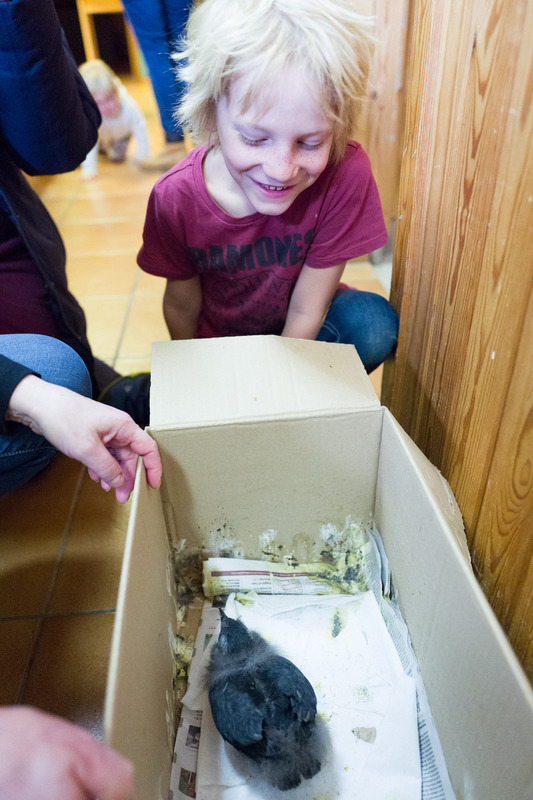 But the big (huge) draw is Toti, a puffin they rescued years ago, who was never able to be released into the wild. Instead, he spends his days waddling around the museum, delighting kids. 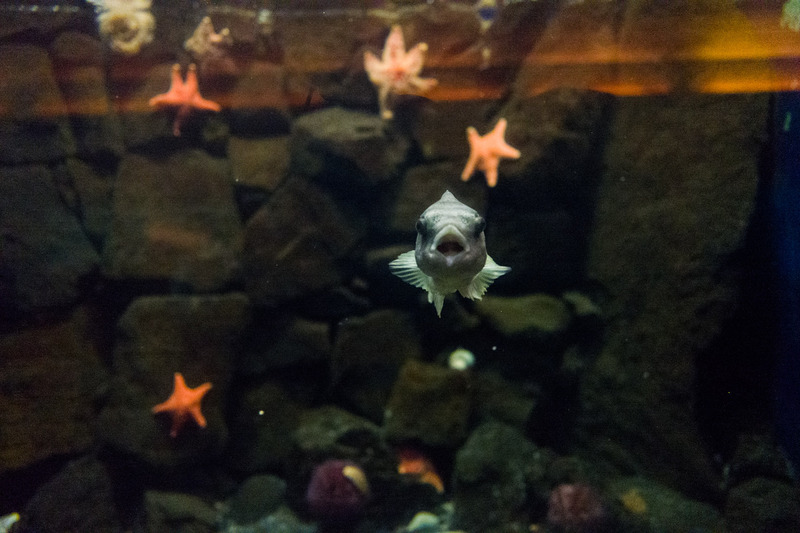 And the exhibits, though small, have a ton of personality. My two guys loved this place. The hallway leading up to the aquarium is lined with pictures of kids holding baby puffins. The staff explained that the babies need to make their way to the water, using the light of the moon. However, many of them get confused by the streetlights, and end up stranded in town. 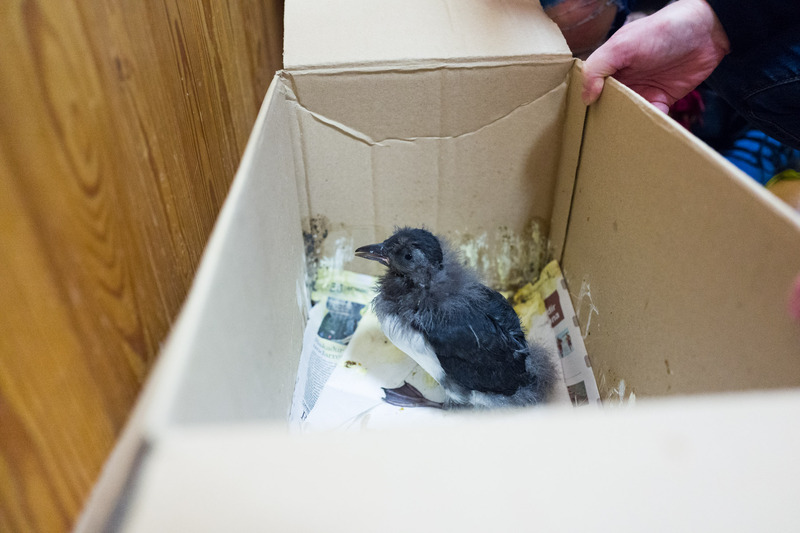 The local kids will go out at night with flashlights, searching for baby puffins. 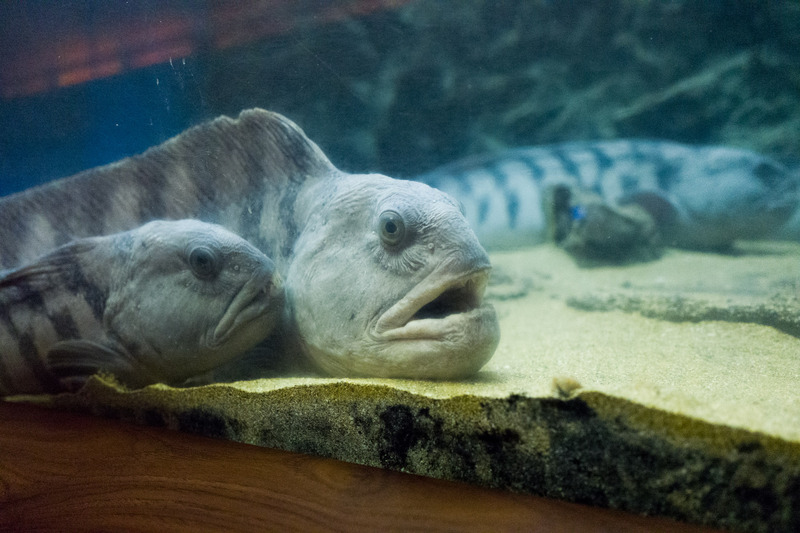 If found, they stick them in a box and bring them to the aquarium the next day. The aquarium will keep them until healthy, then let the child help release them back into the wild. Guess what we did that night? 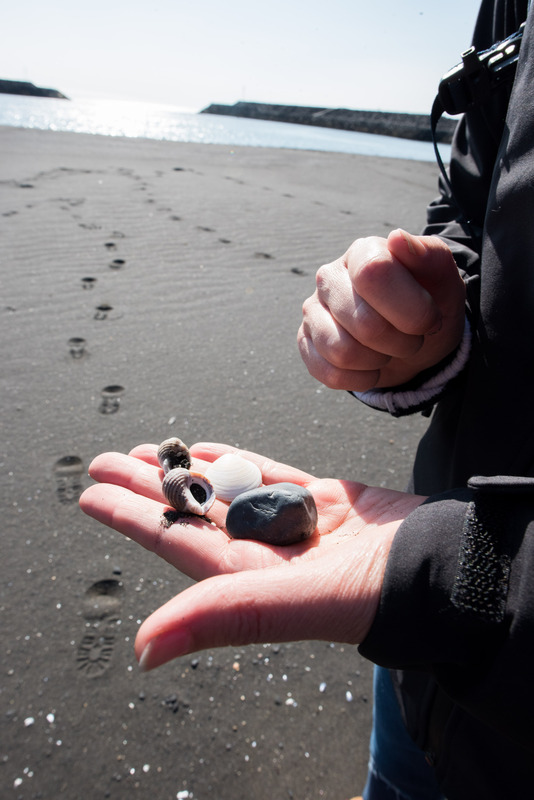 Waited until dark, then searched the streets for baby puffins. No luck, but oh the excitement. This was a total highlight. But I gotta be honest: the jaw-dropping views were mere feet away from a sheer rock cliff of, oh, say, 100 feet. Or so. Mike was Freaking Out. 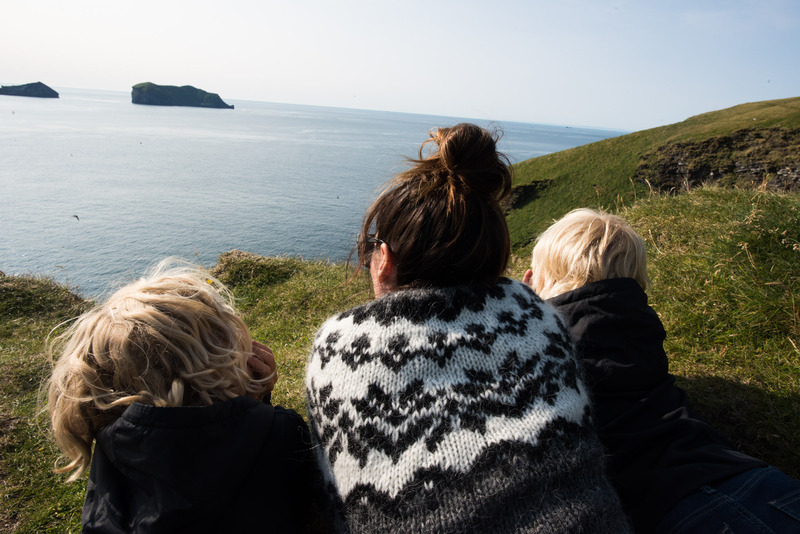 We basically army crawled on our stomachs and I kept a hand on each boy to watch the puffins flying into their nests on the cliff. Once in place, we seriously could’ve watched all day. 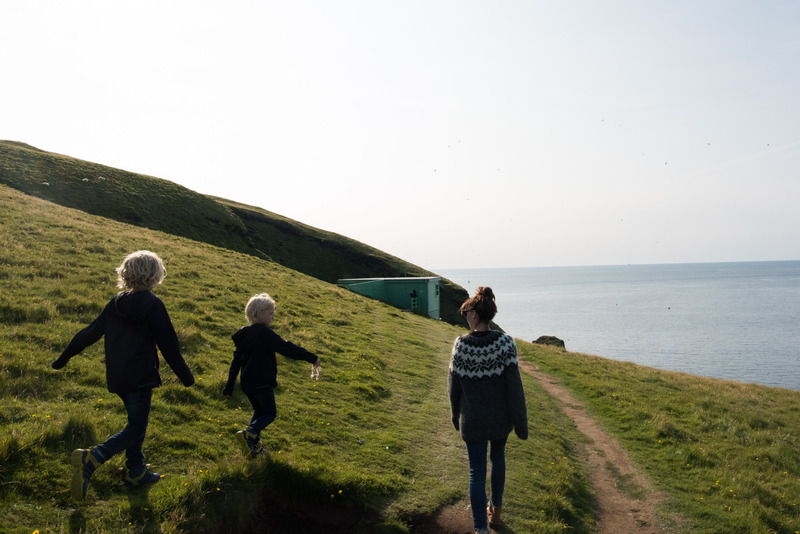 The puffins are insanely cute – their bright orange beaks and round little bellies and wings that have to flap SO fast – the whole experience was pure magic. 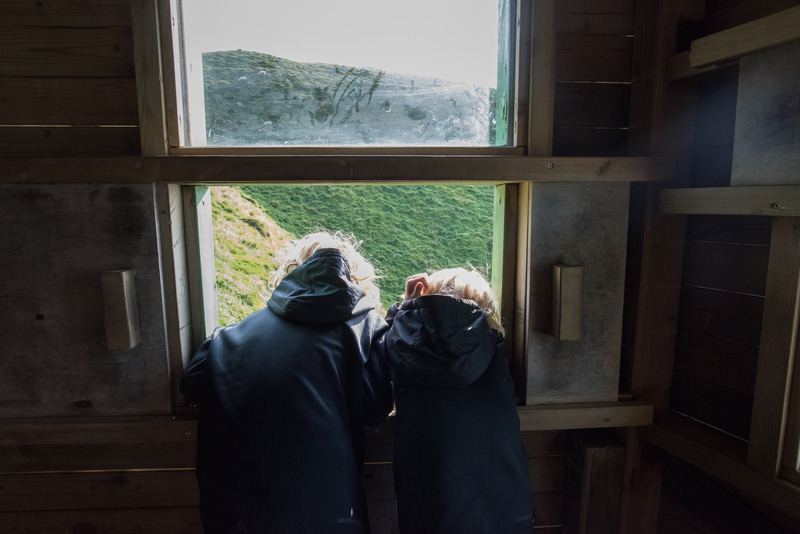 There is also a puffin viewing station that doesn’t feel nearly so death defying, but if your kids can be trusted to listen and stay close, the cliffs are totally worth it. 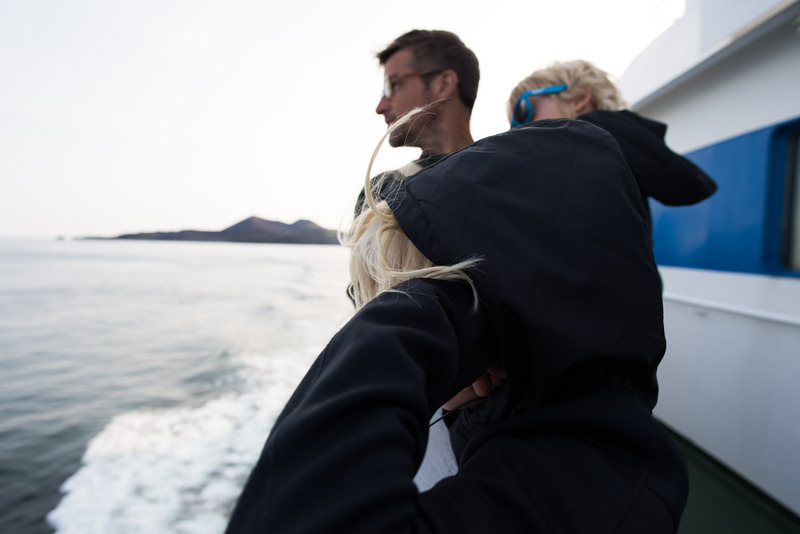 Once we had our fill of the cliffs, we walked around a bit (the entire area is 360 degrees of stunning views), and ran into a researcher with Icelandic Orcas, who let us take a turn watching killer whales off the coast. I mean…wow. You can see what they’re up on on their Facebook page. 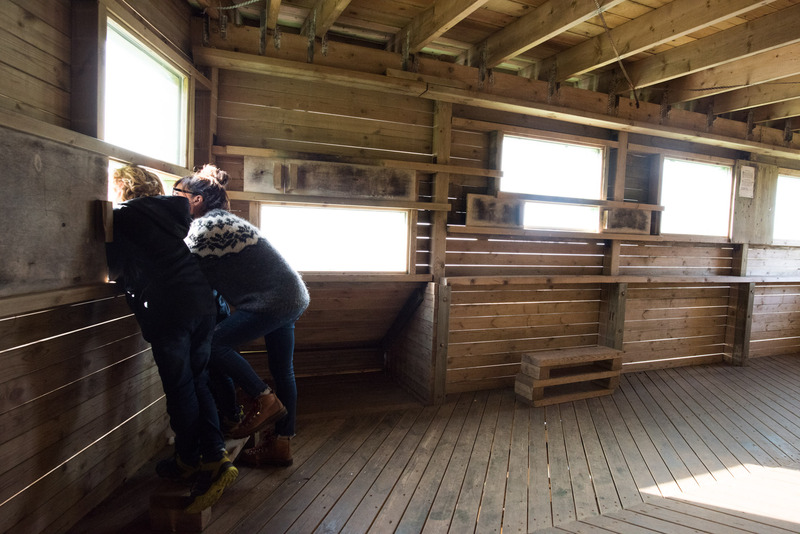 The (safer) puffin viewing station is right off the road as you drive up. If you reach the top (where the above pics were taken) you’ve come too far. We hit the viewing station on our drive back down. 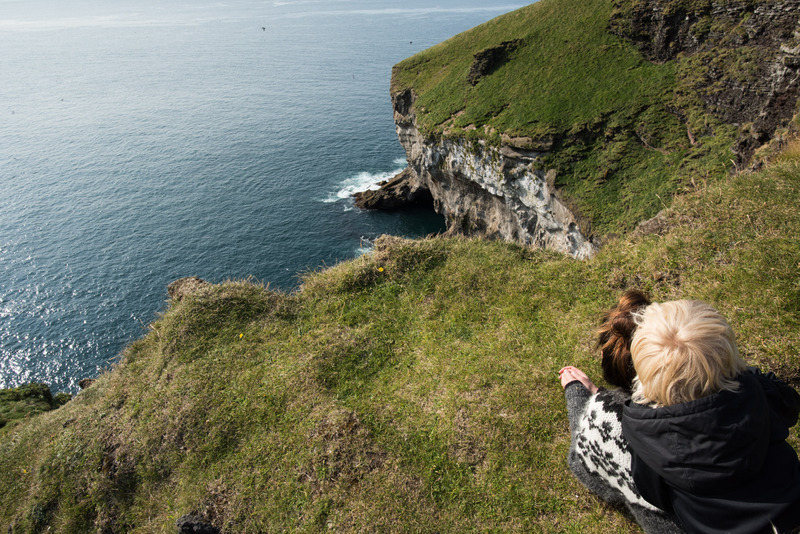 It’s a pretty cool view of both puffins flying and sheep grazing on the cliffs. 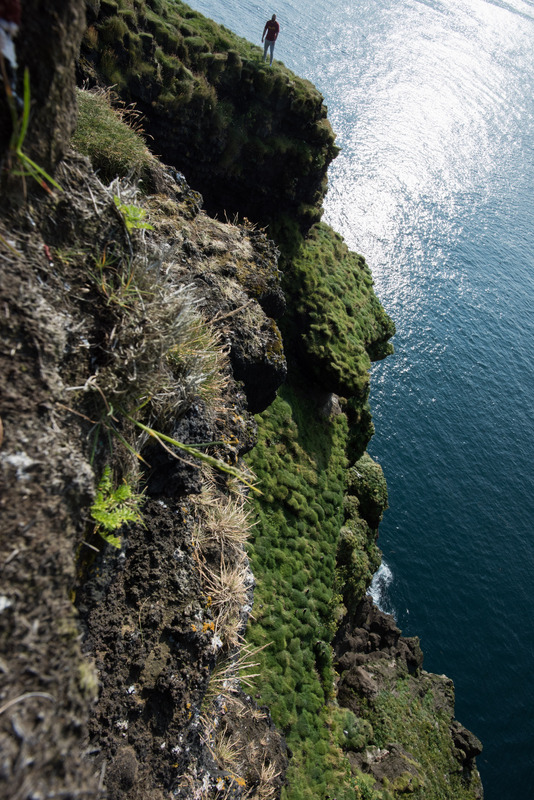 And yes – you’ll have to climb over a fence to get there. 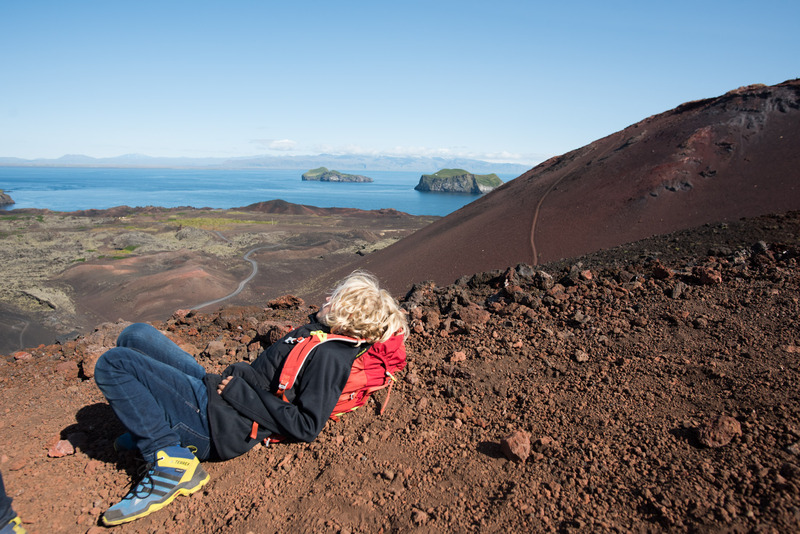 In 1973, a volcano named Eldfell erupted on the Westman Islands. 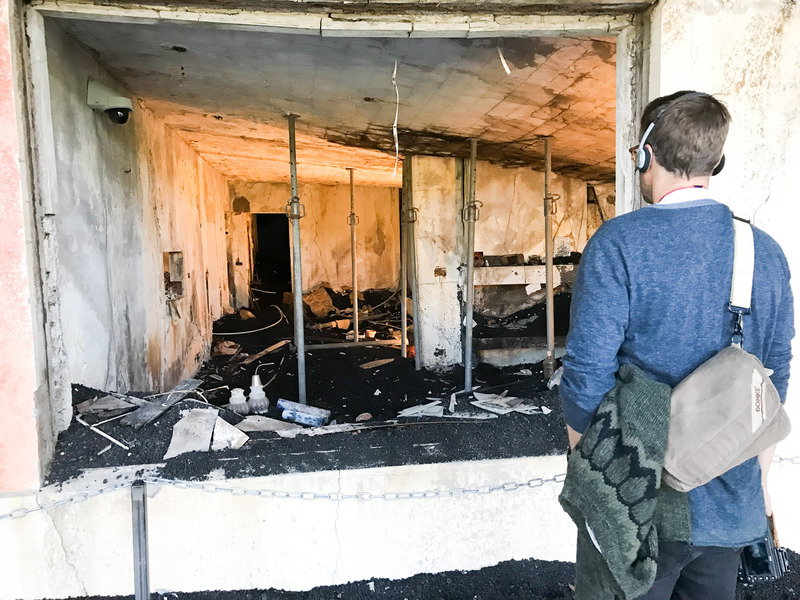 The eruption started around midnight, with a line of fire across the fault line. 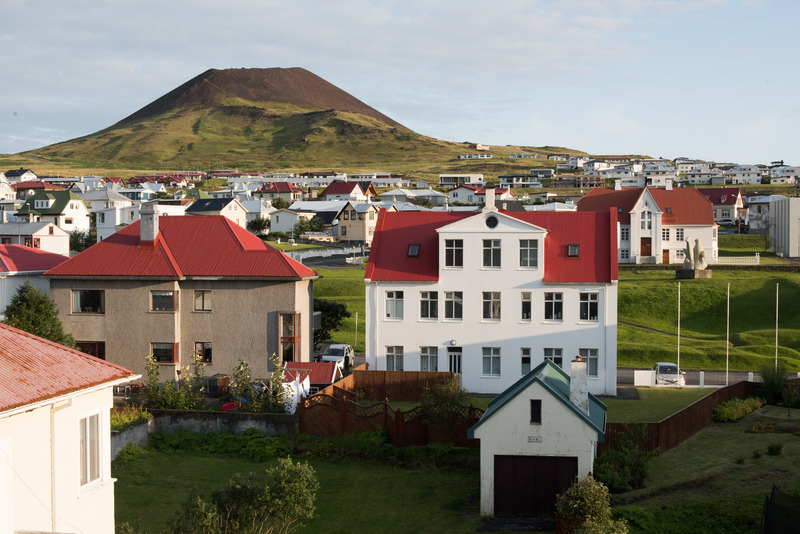 The ensuing evacuation was the stuff of movies, and when it was all over (6 months later), the Westman Islands had grown by 20%, the harbor’s entry-point had been greatly narrowed, and a huge stretch of neighborhoods were completely covered by lava. 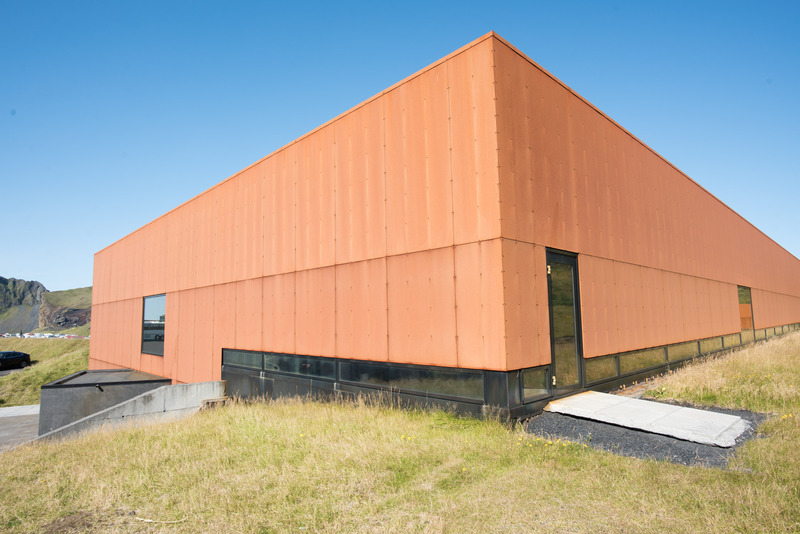 The Eldheimer Museum is built around the excavation of a house buried by the eruption. 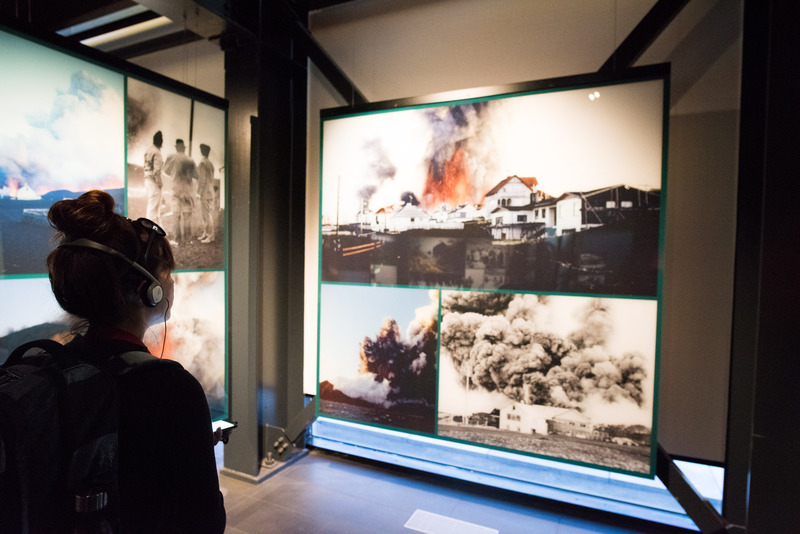 This small museum is one of the most-engaging we’ve visited, and takes you through both the eruption, evacuation, and clean-up efforts. The entire thing is fascinating. 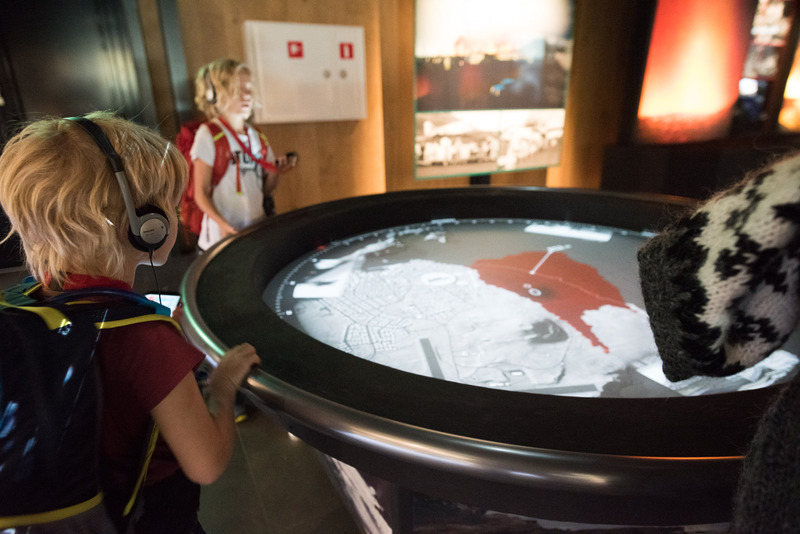 My boys especially loved the light table, where you turn a dial to see how the lava flowed down over the island, into the ocean, and threatened to eliminate the harbor. It helps to put the rest of the exhibit into context. 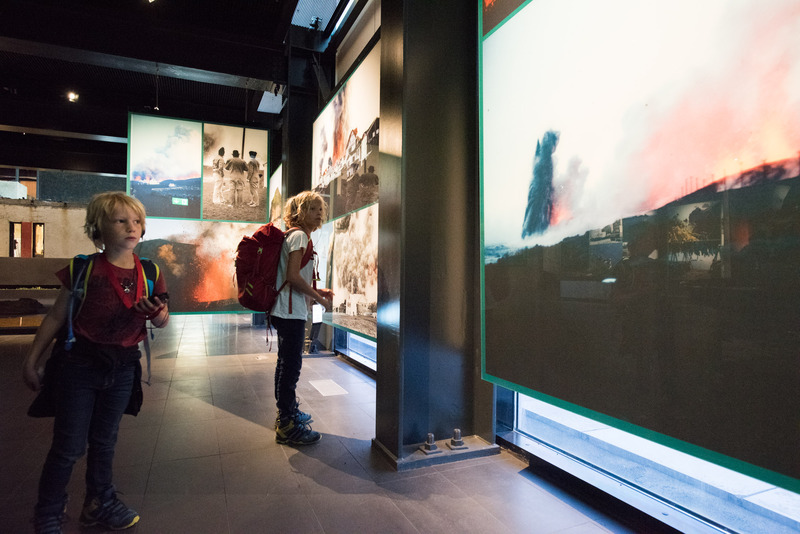 As the audio guide narrated the fight between the front lines and the lava, both boys were listening with baited breath. If you have any additional questions when it’s over, ask the docent. 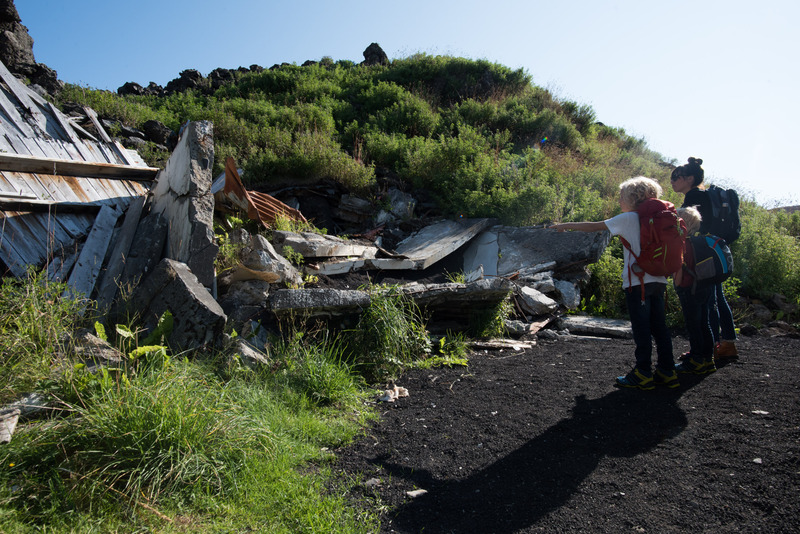 She was 15 at the time of the eruption, and her family was the second family to move back once it was all over. This was real-world education at it’s best. 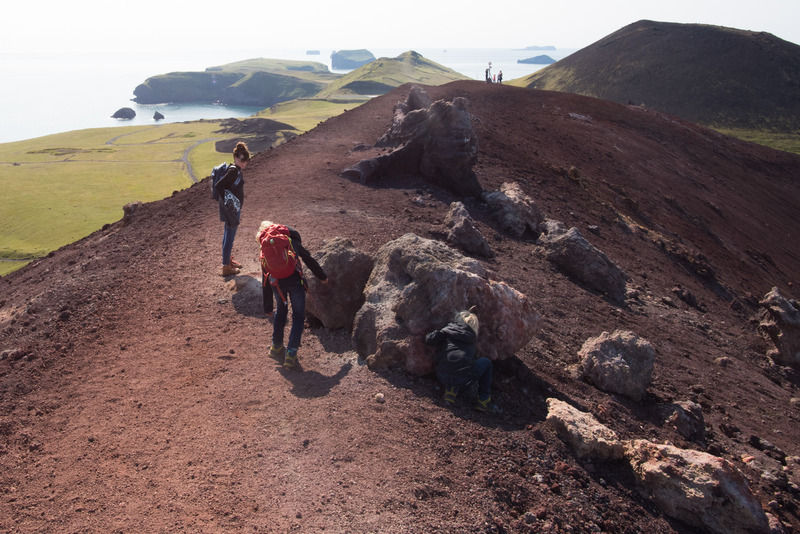 There are two volcano hikes you can do in the Westman Islands: Hegafell – which is no longer active, and Eldfell – which most certainly is. 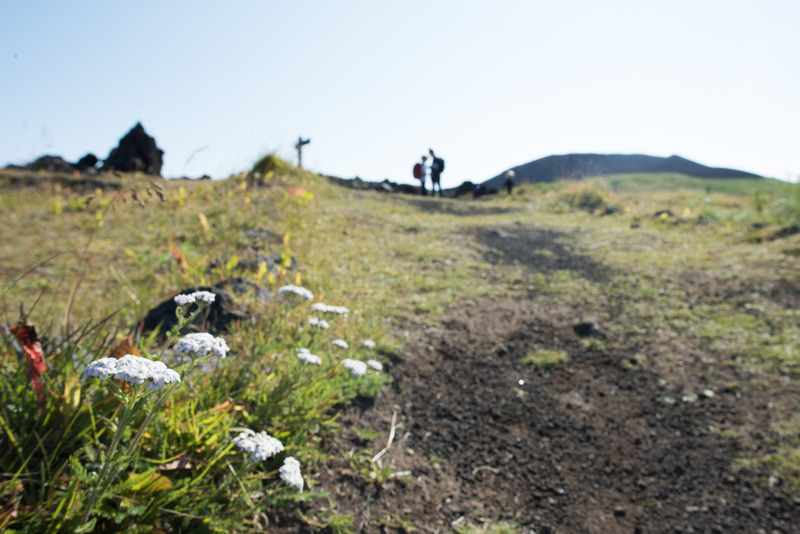 The Eldfell hike is the one to do. 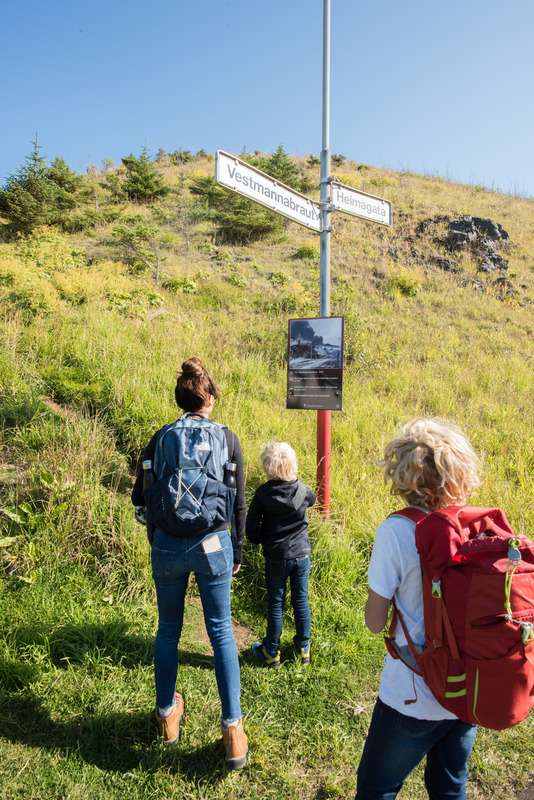 It’s a slightly creepy hike, because the beginning of the hike (which can be started from the museum) is basically a hike over top of the neighborhood buried in the ’73 eruption. Additionally, when you hike to the top, look around for a small cave or crevass in the rock. If you put your hand inside….it’s hot. 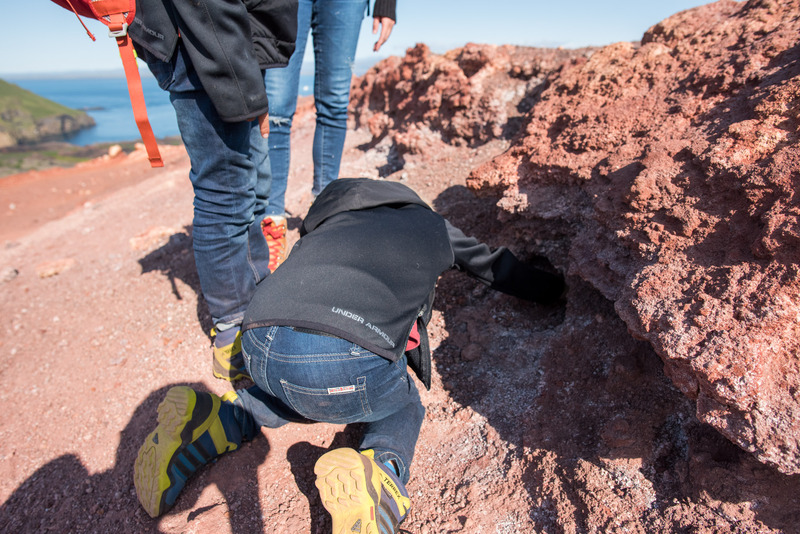 This one (especially since we had just come from the volcano museum) totally blew our little guys’ minds. This one is quick-n-easy, and conveniently located close to the harbor. It’s a perfect spot to walk to if you have an hour or so before your ferry. I think we were only there for 30-ish minutes, but it’s so fun and different that it’s totally worth seeking out. You can ask any local where the Sprangan is, and they’ll easily give you directions. 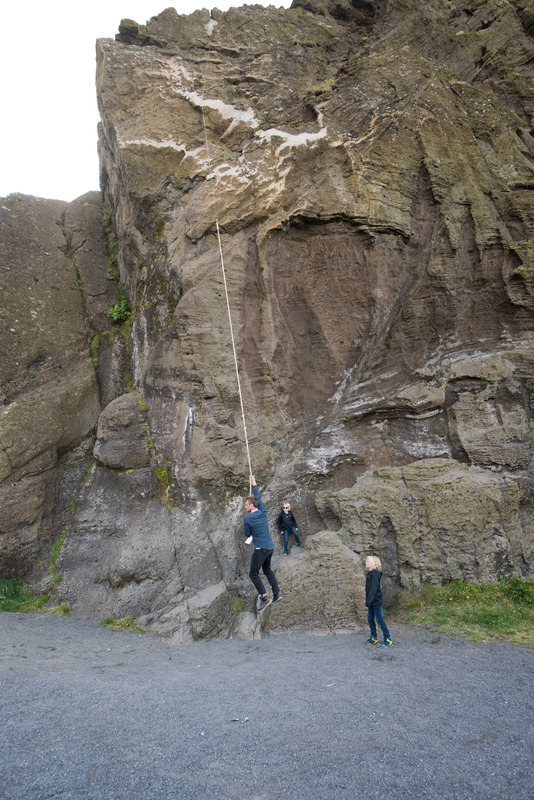 Once there, climb up as high as you dare, and swing down. 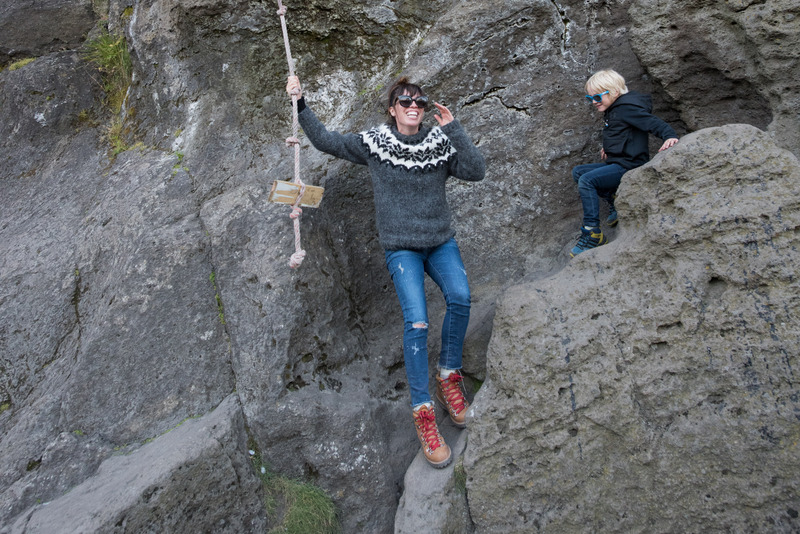 The only piece of advice I can offer is that you realllly want to hit the cliffs FEET FIRST. 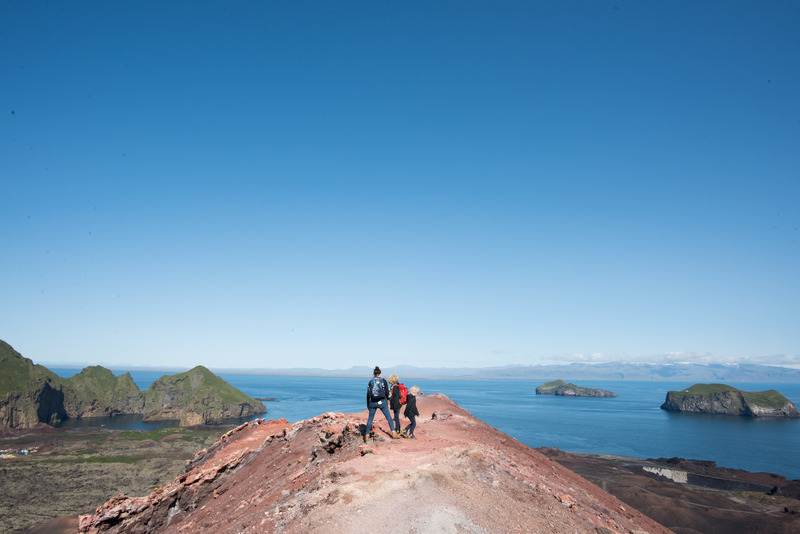 If we had more time, I would’ve added in this Heimaklettur hike (insane views, and the hike ends with a vertical ascent up ladders), this small boat tour around the island (you can even do a private tour that includes dinner in a secluded spot), and a round of golf at the Vestman Golf Club. 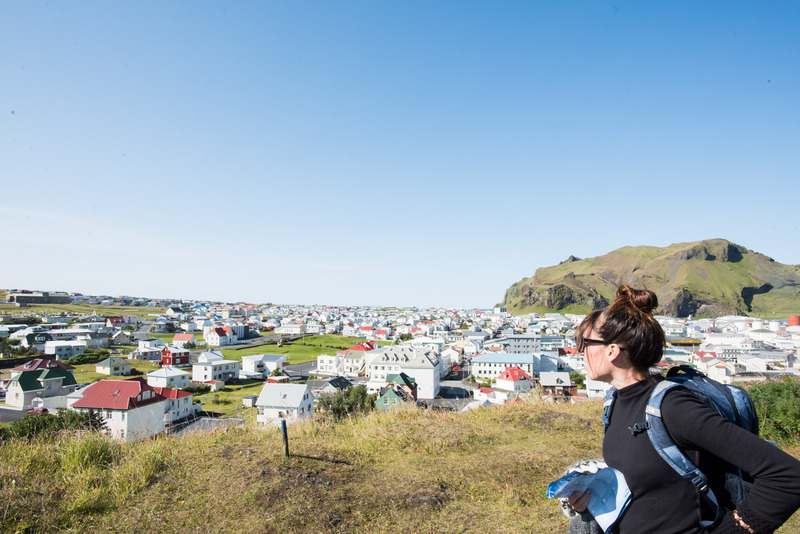 The course is nestled in an extinct volcanic crater. 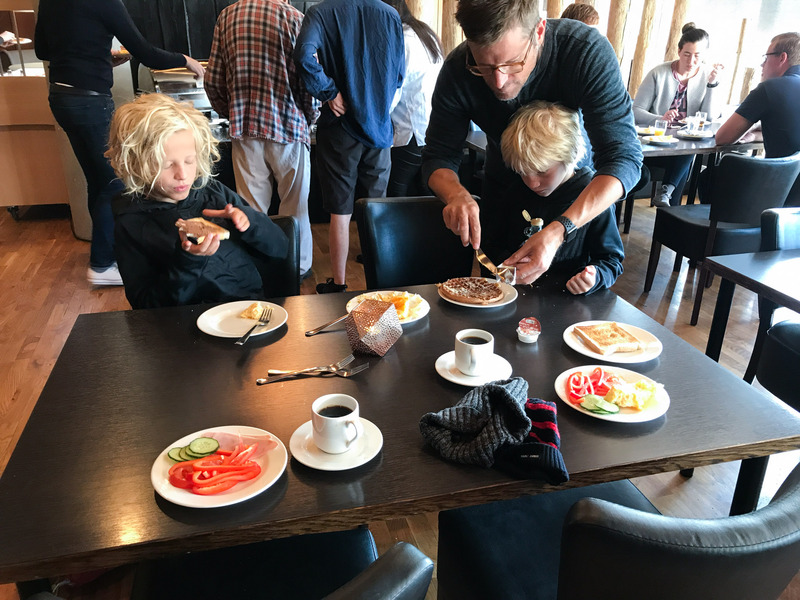 Heda was right – between the adventures, the views, the food, and the laid-back, authentic atmosphere….this was easily one of our very favorite places in Iceland. 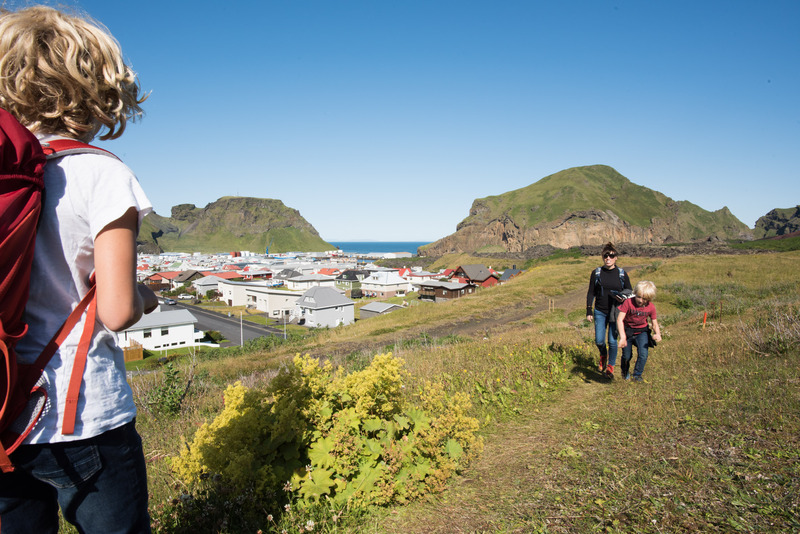 Vestmannaeyjar, we cannot wait to come back. Love hearing about your adventures. It makes me day dream of the day my two boys are old enough to take on these types of trips. How old are your boys? It looks like they enjoyed themselves! Thanks for saying this, and putting it into perspective. 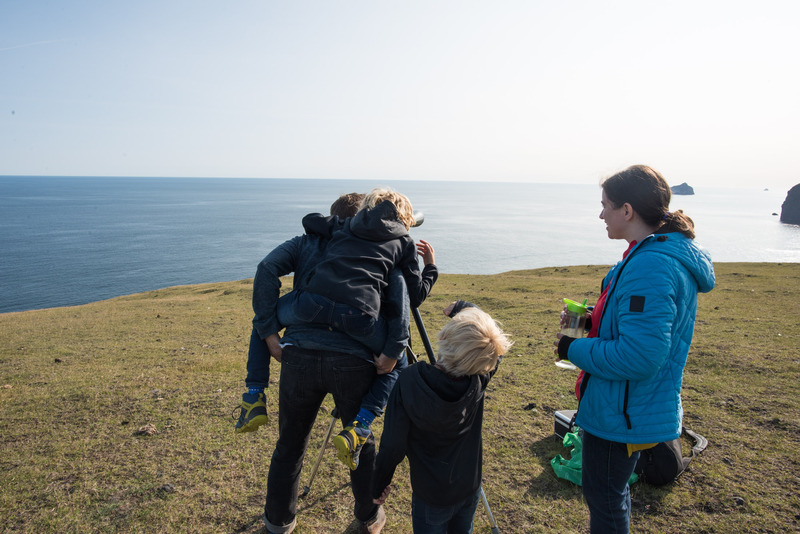 My boys are 3 and 6 and I can see our future adventures through your eyes. I’m heading to Iceland in November for a week long trip with my BFF. Although it will be without kids and definitely into winter I love reading your posts. I tell my boys it’s a recon trip for when we take them and it certainly looks like there’s tons to keep adventurous kiddos and parents happy. What an amazing adventure you guys had, Shana. The photos are breathtaking. What a time you all must have had. Some day . . . .
Shana as always your Trip Photos and shared adventures are a real gift to read and see. Thank you. Next time call me – I would go with you ..
Shana – can you please give me the easy button and send me the exact details – like how many days in each city, what city to fly into/out of, car rental, drive route – in one list? 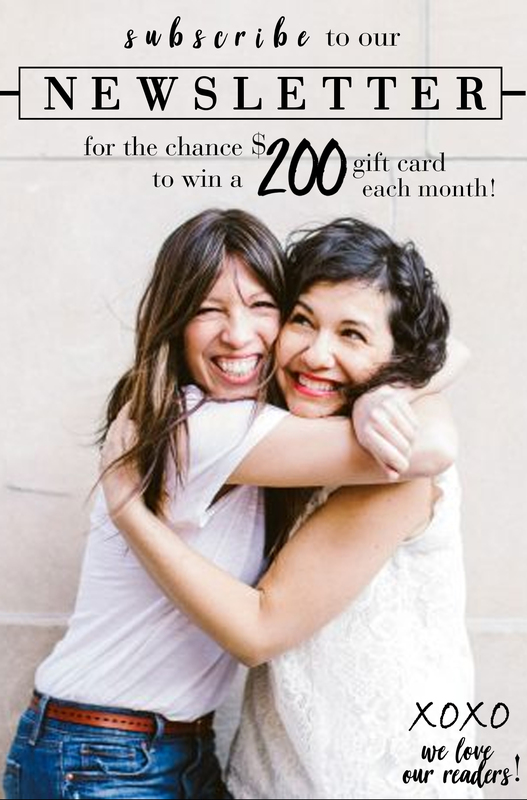 pretty please ….also – do you think a 18 month old plus two siblings ages 8&10 and the husband – will this be fun for mom? Commenting from my room at the Hotel Vestmannaeyjaer after dinner at Gott (which was preceded by the volcano museum/hike up the Eldfell). Wouldn’t have come here without all your suggestions and we are having a terrific time. Puffins tomorrow! Thank you for all the great recommendations!